Integrating our farm with nature is one way to promote resilience in the ecology, resulting in healthier animals and a healthier planet. Watch as our dark-skinned heritage pigs enjoy a picnic in the forest, aerating the soil and loving life. Pigs are meant to till the ground, that's what their snouts are designed to do. They function as natural rototillers, only better. The key is to move them through the forest rather than continually keeping them in one spot, that way we can mimic nature. Plus, pigs are happiest when allowed to live this way, as you can tell from this video --- they're having fun! By allowing the pigs to forage on healthy roots, shrubs, grasses and microbes, we enhance the nutrient density of their meat. Plus, by giving the pigs an outdoor fully-natural environment we enable them to soak up the sunshine resulting in healthy fats which are saturated with vitamins A and D. There's nothing complicated about the way we raise our pigs, we simply observe natural systems and then seek to work alongside them. 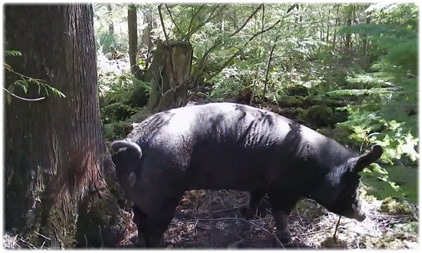 This gorgeous heritage-breed pig is loving her picnic in the forest.